During your Basic training at Arco Vienna, you lay the foundantion for the skills and knowledge needed in archery. With some specific training, this basis can be developed into an exciting career in archery. You can find more information on the Basic training under Arco Fun & Training). 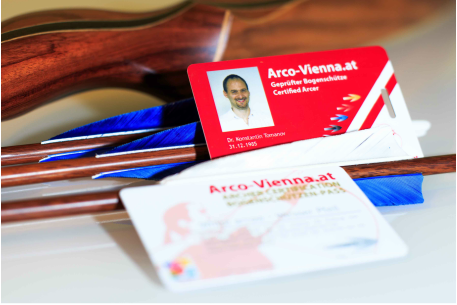 ​Having completed the Basic training, you can shoot, book a shooting lane and come to Arco Vienna at any time. No membership fee, no binding. 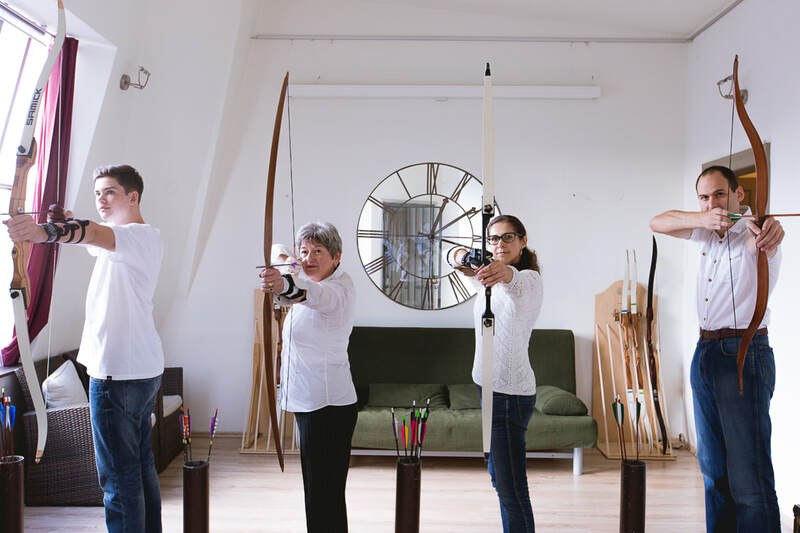 This is free archery at Arco Vienna Club. For those who want to expand their skills and knowledge, we have made the Arco Academy. Show what you can do and do the exam for the "White Arrow" and/or even all the way to the "Gold Arrow" - and then you can certify your skills in archery. The prowes degrees of World Archery (formerly named FITA), the organisation which inter alia administrates the Olympic Games in archery, require theoretical knowledge and practical skills in archery. After the Basic training at Arco Vienna, you can set yourself a new target and earn the following "Arrows": WHITE (like the outermost ring on the target), then BLACK - BLUE - RED - and GOLD as the crowning achievement. Many archery clubs demand that newly arrived archers can present at least the White Arrow certification before being allow to shoot freely. This is a statement that the archer has a relatively constant shot sequence and that s/he can handle bows and arrows safely for self and others. After completeing the courses in Arco Academy, you will receive an archer's certification with your name and picture. It is as big as a standard ID card and you can carry it in your wallet or on your quiver. Where and how can I get a White Arrow? Certified trainers from a World Archery member organisation can examine for the different stufy levels and may issue certifications. Simply put: because it is worth it. With us you will not have to endure boring and expensive theoretical courses. We have developed a special online platform which leads you through the aspects of archery. The entire Beginner's Manual (and parts of the WA Rulebooks) have been converted into tests, creating an entertaining and motivating study platform. Pictures, drawings and texts provide with varied tasks for you to solve. In this way, you can test and expand your knowledge. After each test session, you will receive a review with feedback. You can assign your time at your convenience and immediately find out how good you are. When you are ready, you can sit the real exam and prove your theoretical knowledge and practical skills. The exam fee is 35€, including the attractive archer's certification with your picture and name as a statement of prowess. Thus, Arco Academy is our eLearning system for all WA levels, and is provided our members can use free of charge. Members are all archers who have completed the Arco Vienna Basic training, as well as autodidactic archers who shoot with us regularly. Please note: Arco Academy does not replace the real-life exams for the WA levels. It merely helps you to prepare for them. We will create a study account for you on the platform. After you receive your login data, you can start immediately. The final real-life exams can be arranged with any trainer. I want to successfully study with Arco Academy!